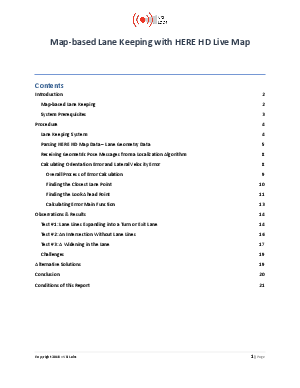 In this report, VSI applies HERE’s HD map data to a lane keeping application and examines performance of lane keeping with a map-based approach compared to a camera and computer vision-based approach. The results show that in all scenarios, the computer-vision-only lane keeping systems got confused and made errors in a vehicle’s trajectory when lane markings were out of the ordinary or invisible. Faced with the same road conditions, the map-based lane keeping system stayed within the desired trajectory outperforming the compute- vision-only systems. This report proves that using a lane model from an HD map can solve common issues involved in computer-vision-only lane keeping.